Most of our activities were documented with video. We used a modified iPhone setup which was handy and discrete, but despite using a good mic our sound quality was never very good. Some of the video material was roughly edited and uploaded to our Vimeo site. 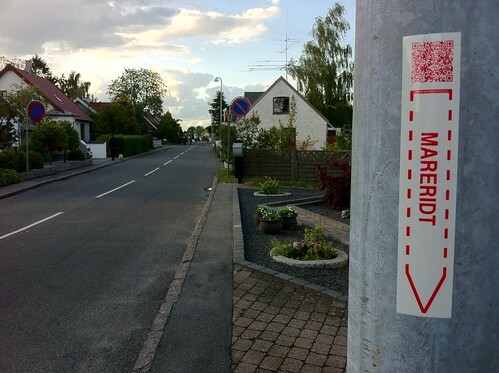 Stickers with QR codes led to a Google Map where points on the map would link to the relevant video about that place. Posted on February 16, 2013 March 9, 2013 by jensbrandtTagged CiTyBee, Hedehusene, Mapping, signage, Stickers, Street Tool Boxes, Video.